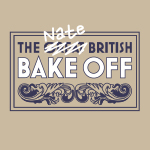 Welcome to the Nate British Bake Off! My name is Nathan and I love to bake. I decided to start this blog to keep track of my baking attempts as I work my way up to applying for the Great British Bake Off. I am a professional photographer by day, but the only food photography experience I have is ‘Instagramming’ photos of my lunch (which you can see at www.instagram.com/nathandainty), so I’ll also be using this blog as an excuse to develop my food photography skills alongside my baking ones. So stick around, I’ll try not to make you too hungry.